The Ottawa Senators' Uber video saga is just the latest negative headline for a team used to bad news. Here's a look at some of the trouble the team has endured over the last year. The Ottawa Senators' Uber video saga is just the latest negative headline for a team used to bad news. Who made the worse move: Sens players or Uber driver? Dec. 15, 2017: On the eve of an outdoor game hosted by the Senators at TD Place, team owner Eugene Melnyk criticizes fan support and speculates the team could move if attendance doesn't improve. "If it doesn't look good here, it could look very, very nice somewhere else, but I'm not suggesting that right now. All I'm saying is that I would never sell the team," Melnyk says. Feb. 9, 2018: The Senators announce they are parting ways with team president Tom Anselmi, who replaced one of the franchise's founders, Cyril Leeder, when he was hired in January 2017. March 19, 2018: Four billboards with the message .MelnykOut go up at four different locations across the city thanks to a GoFundMe campaign that raised more than $10,000 in less than a month. April 7, 2018: Just a year after reaching Game 7 of the Eastern Conference final, the Senators wrap up a season in which they finish second-last in the league with a 5-2 loss to the Boston Bruins. The club's average attendance of 15,046 is its lowest in any full season at the Canadian Tire Centre. May 30, 2018: Senators assistant GM Randy Lee is charged with second-degree harassment after allegedly making lewd comments and rubbing the shoulders of a 19-year-old male hotel shuttle driver in Buffalo during the NHL's pre-draft combine. He's suspended by the team in June and steps down in August. June 12, 2018: News breaks that the wife of team captain Erik Karlsson has filed an order of protection against the girlfriend of Senators forward Mike Hoffman, alleging harassment and cyberbullying. In an application for a peace bond filed May 4 in an Ottawa court, Melinda Karlsson alleges that Monika Caryk posted hundreds of derogatory online messages aimed at her and her husband. "Monika Caryk has uttered numerous statements wishing my unborn child dead," Karlsson said in the sworn statement. The Karlssons' first child, a son named Axel, was stillborn in March. June 19, 2018: The Senators trade Hoffman to the San Jose Sharks, who immediately returns to the Atlantic Division when he is flipped to the Florida Panthers. "Our dressing room was broken," Senators GM Pierre Dorion says two days later. "We have to have a dressing room that wants to win together. Key components for us moving forward are character, leadership, accountability." Sept. 10, 2018: Senators defenceman Mark Borowiecki and Melnyk appear in a team-produced video focusing on the franchise's plan to rebuild. The six-minute clip goes viral. At one point, Borowiecki asks Melnyk how he feels about the dressing room. Karlsson's name never is mentioned, causing trade speculation to pick up. Sept. 13, 2018: With just one year left on his contract and after he didn't accept an offer for an extension over the summer, Karlsson is dealt to the Sharks for four players and two draft picks the day before training camp. "Erik is an exceptional hockey player whose skills delighted our fans for the past nine years," Dorion says. "We thank him for his dedication to hockey, and we wish him all the best. This is the right moment for us to rebuild our team, and shape our future with a faster, younger and more competitive team on the ice. We are going to build a culture of consistency which will allow this team to sustain better performance over the long term." 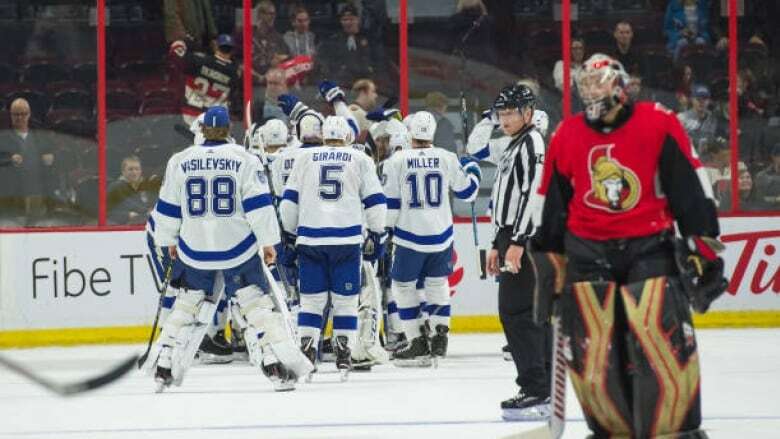 Nov. 4, 2018: The Senators lose 4-3 in overtime at home to the Tampa Bay Lightning, giving up the tying goal in the last minute before a season-low crowd of 11,364. It's the team's sixth loss in the past seven games, erasing memories of a promising start to the season. Nov. 5, 2018: A report comes out about a video from an Uber vehicle featuring seven Senators players discussing their ineffective penalty kill and mocking assistant coach Martin Raymond. The team puts out a statement calling it a 'privacy breach' and the players involved apologize to Raymond and their teammates.